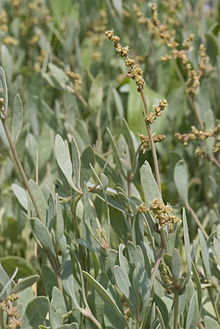 Sister genus of Atriplex, has sometimes been included. Halimione Aellen, Verh. Nat. Ges. Basel 1937-8, 49: 121. (1938), nom. nov. Type species: Halimus pedunculatus (L.) Wallr. International Plant Names Index. 2016. Halimione. Published online. Accessed Feb. 26 2016. The Plant List 2013. Halimione in The Plant List Version 1.1. Published on the internet. Accessed: 2016 Feb. 26. Tropicos.org 2016. Halimione. Missouri Botanical Garden. Published on the internet. Accessed: 2016 Feb. 26. For more multimedia, look at Halimione on Wikimedia Commons. This page was last edited on 26 September 2018, at 13:58.